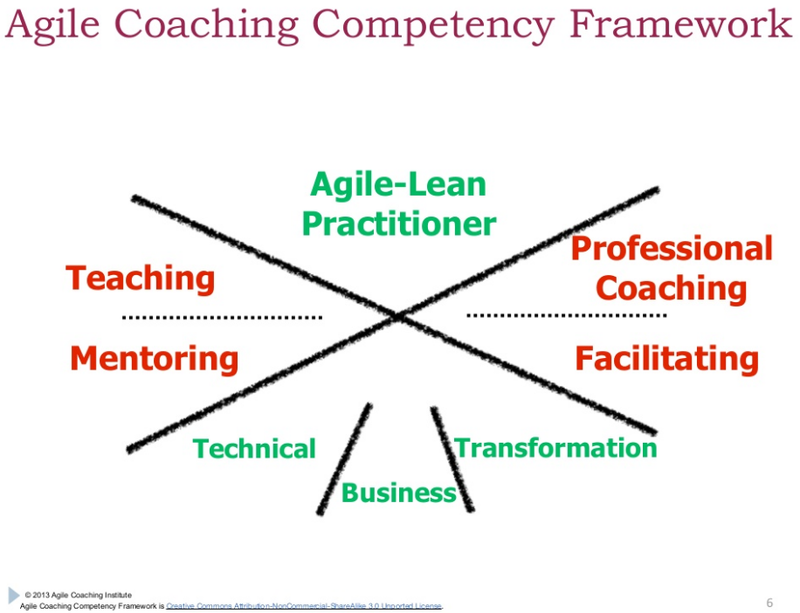 In a presentation about the framework, Lyssa Adkins and Michael Spayd explain how it can be used as a self-assessment tool, for hiring and developing agile coaches, or to help communities of agile coaches to grow. 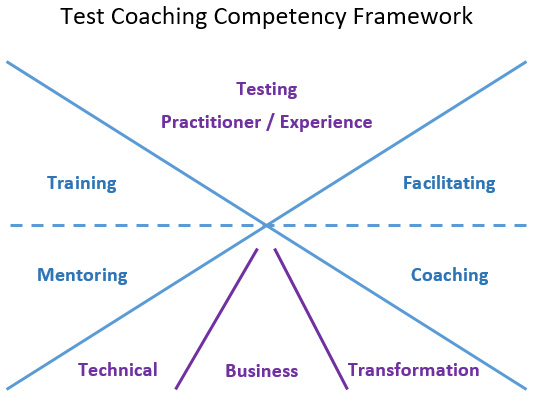 I like the simplicity of the framework and could see an opportunity to apply it to the testing domain to explain test coaching. As a small disclaimer, I have never heard Lyssa and Michael explain their framework in person, so I'm not entirely sure how true my interpretation is to their original intent. Starting at the top, testing practitioner reflects the relevant experience that a person has. Different people will have different interpretations of what this means. Shading of this slice might reflect number of years in industry, number of organisations, variety of roles, etc. 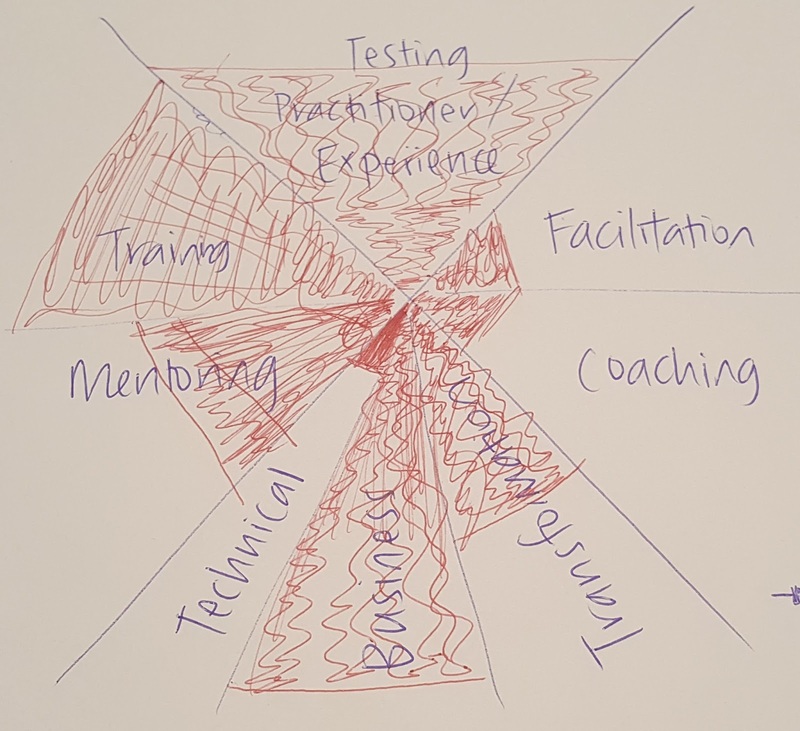 If occupying a role is reflected at the top of the framework, the knowledge that you build through that experience is reflected at the bottom as technical, business, and transformation mastery. In simple terms, shading of the practitioner slice shows what you've done, shading in the mastery slices shows what you've learned as a result. On the left of the framework are the skills that are important to communicate mastery to others: training and mentoring. The distinction is in the size of the audience. Training is prepared material that is delivered to a group of people. Mentoring is transfer of knowledge from one individual to another. Both training and mentoring require the coach to have knowledge of the topic that they're helping someone with. On the right of the framework are the skills that are important to enable others to find their own solutions: facilitating and coaching. The same distinction in size is present: facilitating is to a group of people and coaching is between individuals. A person conducting these activities is guiding a group or an individual towards the discovery of their own solutions. Skill in facilitation and coaching does not come from personal mastery of a topic, but instead in developing the ability to draw the best from people through questioning. I needed to be able to explain the skills of a Test Coach in order to recruit. I have used my version of this framework as an activity in eight Test Coach interviews so far. 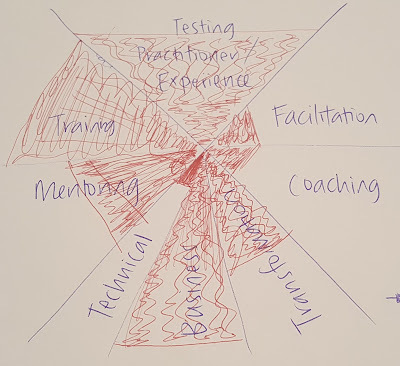 I draw the framework on a piece of paper, explain what is included in each slice as above, then ask the candidate to assess themselves and talk about their decisions. I've found the test coaching competency framework is an excellent alternative to the general prompt of "tell us a bit about yourself". I use it at the start of the interview to give more structure to the opening conversation and clearly illustrate what I'm interested in hearing from the candidate. I've found that it empowers people to talk more freely about both their achievements and opportunities for growth. I like that it gives control of the conversation to the candidate for a period of time rather than asking them to respond to specific questions for the entire interview. What do I do with the results? I haven't been seeking an individual who is strong in every area, but I am looking to build a team of coaches with complementary skills and experiences. The shaded frameworks are helpful in determining how a group of individuals might become a team. Once a team is formed, I imagine that this information could help guide initial allocation of work and allow me to identify some opportunities for cross-training. 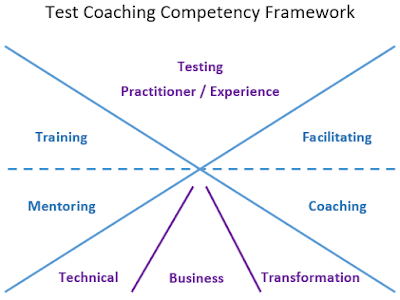 I have found the test coaching competency framework useful and would recommend it to others who are looking to build test coaching teams. I like this concept of coaching a lot. I feel like the role of a test manager might even dissappear over the upcoming years and be replaced by a concept of champions or coaches. Anyways. Thanks for the article. Thanks Katrina. 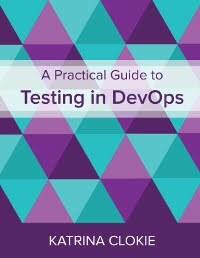 I am a QA Coach for American Airlines and have been looking for this material. 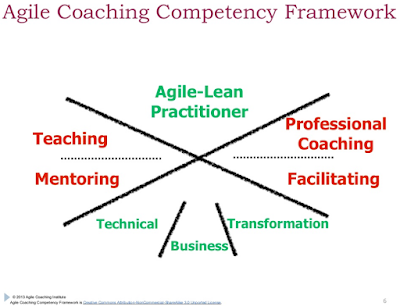 I see so much out there for Agile Coach but not Test Coach. This is modified nicely for Testing Coach!